Handmade, deceptively similar to real granite. For you a pleasing sight. For hungry birds a cosy feeding place. 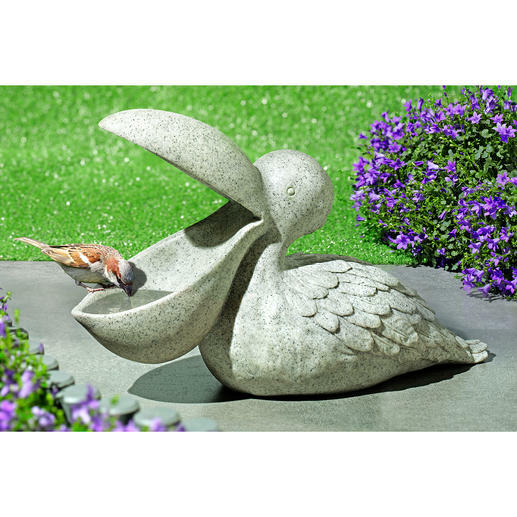 A huge pelican: Perfect as a drinking basin, feeder or birdbath. Made of weather resistant polystone. At first glance, it is a decorative sculpture. On closer inspection, however, its versatility and functionality become apparent. With its throat pouch wide opened, its mighty beak (16cm (6.3") wide, 6cm (2.4") deep!) turns out to be a large basin. This basin holds up to 250ml of water, making it an ideal drinking place for birds, hedgehogs, squirrels etc. In the summer it also makes a perfect birdbath, and in the winter it’s a great feeder. Firm and stable, shaped from stone flour and synthetic resin, the sculpture has the characteristic grey/white inclusions. Like granite, it resists both burning heat and rain. Please place in a sheltered spot in winter. The sculpture takes on an increasingly beautiful, more striking colour over the years due to the effect of the wind and the weather. The edge of the beak offers a good perch for eating and drinking. The upper beak shields the water/food from falling moss and twigs: The contents remain clean. Size 55 x 19 x 35cm (21.6" x 7.5" x 13.7") (L x W x H). Weight 1.6kg (3.5 lbs). Can be easily wiped clean.